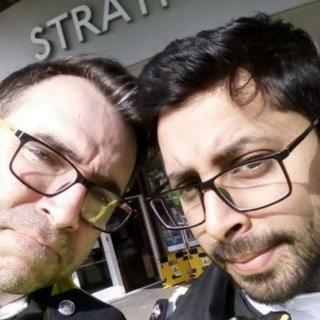 The Met Police has apologised after two officers took a selfie at a murder scene and posted it on social media. Uniformed officers from Newham, east London, took the photo outside the Stratford Centre on Thursday, where a man had been fatally stabbed two days before. They shared it on the Forest Gate North Twitter page with the caption: "Crime scene at Stratford mall today." A spokesman said the officers showed a "lack of judgement and sensitivity". A crime scene is still in place and no arrests have yet been made. Many Twitter users condemned the photo, which has since been taken down. The Met Police spokesman said the officers involved would be "reminded of how to use social media responsibly to keep the public informed of their work in the community, arrests and catching offenders". The victim, believed to be in his 20s, was pronounced dead at the scene at about 22:30 GMT on Tuesday, about an hour after police found him with multiple stab wounds. Police believe the victim and a friend were involved in an altercation with a group of young males before he was stabbed. His next of kin have been informed and a post-mortem examination will be held. He was the eighth person to be fatally stabbed or shot in London in one week.